The Chinese traditional culture has a long history, and it has made great contributions to Chinese people's health and longevity. It absorbs the essence of Chinese traditional health theory—Ru, Shi, Dao, Yi, and propose a theory of dredging collaterals and health preservation-dredging collaterals, cultivating vitality, motivating dynamics, Meditations, and built Yiling Health Center. Good sleep is the foundation of easing mind, and dealing with stress, anxiety, irritability, depression, poor sleep quality and mental efficiency decline and other psychosomatic disease which caused by social psychosocial stress. Jujube Seed Oil Supplement Soft Capsule is a healthcare product based on dredging collaterals and health preservation, and it generates from traditional edible Chinese herbal medicine to improve sleep, keep full of spirit and energy, keep quick-thinking, improve efficiency of mental activity. The hundreds of kilometer long Taihang Mountains are widely distributed with jujube trees on the hills of 200-800m high. Zizyphus jujube belongs to deciduous shrubs or small trees, the plant is 1～3m tall, the branch has spines, the leaf is long elliptical, the flower appears in the early summer, and the fruit is as big as a grape or as small as a pearl, and it tastes sour and sweet. The zizyphus Jujube Kernel is a dual-purpose resource of herb and food. The best zizyphus Jujube Kernel in quality is made in Xingtai which is plumpness, purple, no shell, shiny, with high value of medical function and shown to have a variety of efficacy of meditation, stomach, nourish, soothe the nerves and so on. Yiling Jujube Seed Oil Supplement Soft Capsule is approved by the state of health care products (country food healthy character G20160175), using the wild zizyphus Jujube Kernel of Xingtai as the main raw material, authentic ingredients, prominent curative effect, improving sleeping significantly. The modern pharmacological researched have proven that :The zizyphus jujube kernel is effective in tranquilizing the mind, helping sleep, lowering the blood fat, reinforce the immunity, resist hypoxia and oxidation, and improve the cerebral ischemia, etc. And it is tested that the zizyphus jujube kernel oil extracted from zizyphus jujube kernel mainly contains saturated fatly acid (about 31%) and unsaturated fatty acids (about 66%), saturated fatly acid is given priority to palmitic acid, stearic acid, arachidic acid, Unsaturated fatty acid is mainly include oleic acid, linoleic acid, eicosenoic acid. Taihang Mountain, widely distributed with wide zizyphus jujube, forsythia, walnut and other food and herb resources in sufficient sunshine and without any environmental pollution, is natural resources of health products. Shijiazhuang Yiling Pharmaceutical has built a 100,000mu wild food and herb resources base to harvest wild zizyphus jujube and develop various natural and health food. Health product Jujube Seed Oil Supplement Soft Capsule, approved by the nation, adopts Taihang Mountain wild genuine zizyphus jujube kernel which is plumpness, purple in color. As the main raw material, the oil of zizyphus jujube kernel is made by squeezing, filtering and purifying at a low temperature. The Jujube Seed Oil Supplement Soft capsule remains wild genuine zizyphus jujube kernel's natural nutrition. It does not contain any chemical additives. All products have prominent curative effect, green, safe and without pollution. In the quick modern society, people are attacked by insomnia, dreaminess, poor sleeping quality, dizziness, amnesia and aneuria, etc. because of pressure from life and work, the serious sub-healthy state is the key cause to hypertension, arteriosclerosis, cardiovascular and cerebrovascular diseases, and diabetes. 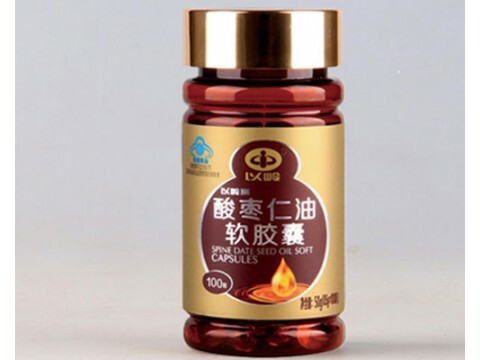 Yiling zizyphus jujube kernel oil capsule is made from the kernel of wild zizyphus jujube in Taihang Mountains without any pollution. The product can improve the sleeping quality. It is a high grade, green and healthy gift product.